... and so we have the familiar ingredients of an Ayckbourn play. 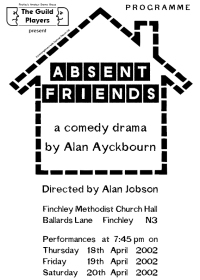 Many people see Alan Ayckbourn as a writer of domestic comedy. However, the interpretation of the word 'comedy' is personal. The play is described in its title as simply that - a play. The comedy is derived out of the human condition - we humans live lives where our treatment of each other can cause embarrassment, hurt and domestic upheaval which is interpreted by some as the divine comedy of life. The domestic situations presented to us are uncomfortable for us, the audience, because Ayckbourn's characters are so much like ourselves. Ayckbourn does not preach, he observes. In comparison, the characters in Chekov comedies are more complex and less than ordinary.